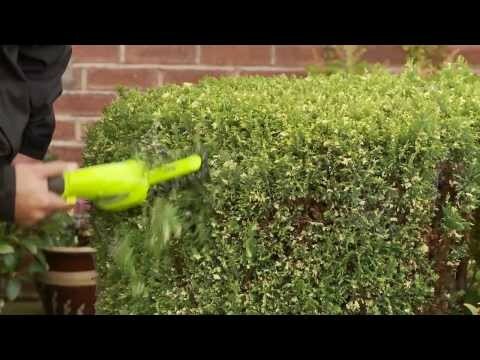 Style hedges and lawn edges with ease with this 3.6V cordless trimming shears by Garden Gear. Powered by a lithium-ion battery, the amazing hedge and edge trimming shears provides complete cordless freedom. These amazing shears also come with an extension handle to help get those harder to reach branches. The compact design is incredibly lightweight at just 0.8kg and comes with two interchangeable blades that provide up to 40 minutes of continuous operation on a full charge. The grass shear blade with an 80mm cutting width will make easy work of lawn edges, while the trimming blade will cut hedges, shrubs and bushes up to 8mm in diameter. Comes complete with installed lithium-ion battery, charger and two blade guards for safety. Also available to purchase is the cordless trimming shears without the extension handle, 100ml or 500ml Trimmer Lubricating Oil, 15m Extension Lead and RCD Circuit Breaker Socket. This product comes with a two-year manufacturer’s warranty, giving you complete peace of mind.